Learn about Tuolumne County, California, by reading Prospecting the Great Unfenced by Charlie Spence, IFA Member and Aviation Writer. It features a mini, but thorough tour of the destination, plus all you'll need to know to plan your trip including getting there, objective information on places to stay and eat, and things to do. At the end of the article, we've provided a summary of the contact information for your easy reference. Enjoy! Columbia Airport is walking distance from the town. 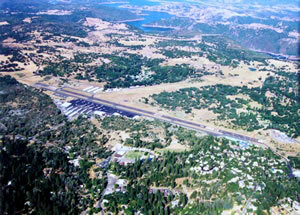 Lower right, at end of runway is Colombia State Historic Park. New Melones Lake in the background offers excellent water sports and fine fishing. Photo courtesy Tuolumne County Visitors Bureau. When gold was discovered at Sutter's Mill in 1848, it was six months before Americans reached another gold field in what is now a part of 'The Great Unfenced' area of California. Today, however, you can reach it in a matter of hours and be a 49er at the historic sites, even swirl your pan and look for your own shining nuggets in the heart of the Mother Lode country. Tuolumne (pronounced 'Too-all-a-me') County is in the Sierras and known as the playground with a heart of gold. This is one of the Golden State's original counties, and when you visit it, you will get the feel of what the gold hunters experienced. Many towns sprang up, wherever someone found a piece of gold. The towns are still relatively small and touches of the settlement days remain to transport you back to those rip-roaring times. What was once called Hildreth's Diggin's now is known as Columbia, an ideal place to start your exploration. 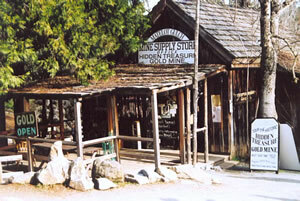 Shop like the 49ers did in this Historic Park Hidden Treasure Gold Mines Tour and Matelot Gulch Mines Supply Store. Columbia is the best preserved gold rush town in the Mother Lode. And for good reason. By 1980, the Gem of the Southern Mines had produced more than $1 billion (in today's money). The town bustles with shops, exhibits, and lively activities of the 1850s. Throughout the year special events celebrate the golden years. For instance, the historic Senora Pass Wagon Train brings to life the Clark-Skidmore wagon train, which was the first to cross over the Sierra Nevada via Senora Pass. Its destination is the town of Twain-Harte and arrives during the town's Summer Festival. You may go off on your own to pan in the streams or sign on with one of the local businesses where you can get assistance from professional gold prospectors. They offer all the supplies you will need. 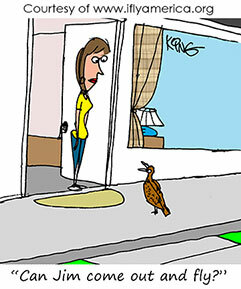 Go out for a few hours, for the day, or for extended periods. For example, you can take a five-hour trip that includes digging, sluicing, and panning for gold, have a picnic lunch and collect beautiful rocks. The cost is about $80. Keep all the gold you find but don't expect the riches that drew thousands to this area more than 150 years ago. Jimtown 1849 gold mining camp by Gold Prospecting Adventures. Pan for your fortune. This entire area is called 'The Great Unfenced' because it has so much open territory. Nearly half of Tuolumne County is unsettled. The National Forest, the Sierra Nevada, and the Emigrant Wilderness occupy a major portion of the county. Emigrant Wilderness is untouched by any motorized vehicles. 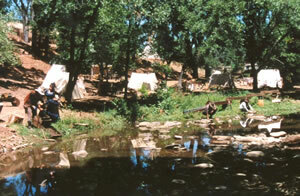 Many motion picture and TV productions - such as Little House on the Prairie - use Tuolumne County for settings. If mining for gold isn't your style, there are still a wide variety of things to do and see in this unique and historic area. Take a steam-train trip or visit a railroad roundhouse. Guided tours of the Round House are offered throughout the year at a 26-acre steam locomotive facility operated by the California State Railroad Museum. Excursion train rides chug along on Saturdays and Sundays, April through November. More than half of the 400 movies that have been made here have used the steam train. 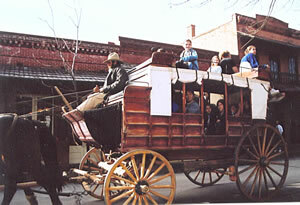 The whole family will enjoy the stagecoach ride. Or, go nautical. Tuolumne County has great whitewater activities, offering everything from float boats to Class 5 runs on the Tuolumne River. Cherry Creek and North Fork on the Stanislaus River offer varying degrees of whitewater excitement opportunities. Try rafting or kayaking in this "Great Unfenced" area. For any whitewater activity, it is best to call a day ahead and make reservations as this popular activity sells out quickly. You will find excellent fishing in remote mountain streams or on lakes and reservoirs. Try the waters of Don Pedro, Lake Tulloch, or New Melones for a 12-pound bass. Stanislaus National Forest offers 811 miles of rivers and steams with 18 species of fish. For a special fishing trek, horseback guides to the Emigrant Wilderness are available. Elevation of Tuolumne County ranges from 300 feet to more than 10,000 - meaning you can golf on one day and snow ski the next. Just down the road from Columbia you will find Yosemite National Park. About 95 percent of the park's 1,169 square miles is wilderness area. Yosemite boasts nine magnificent waterfalls with the entire park scenic wonders of high cliffs and rolling meadows. The only difficulties you might experience here are choosing which of the many activities you want to enjoy. For a much more detailed look at what you can find in Tuolumne County, go to their website - www.thegreatunfenced.com, where you will also find a wide selection of lodging and restaurants. Airport is a base for fire-fighting aircraft during dry season, usually May through October, so be alert for unusual flight activity. Notice: This information is current as of March 2003. It is recommended that you contact the numbers, and/or visit the websites above to determine any changes to the information.